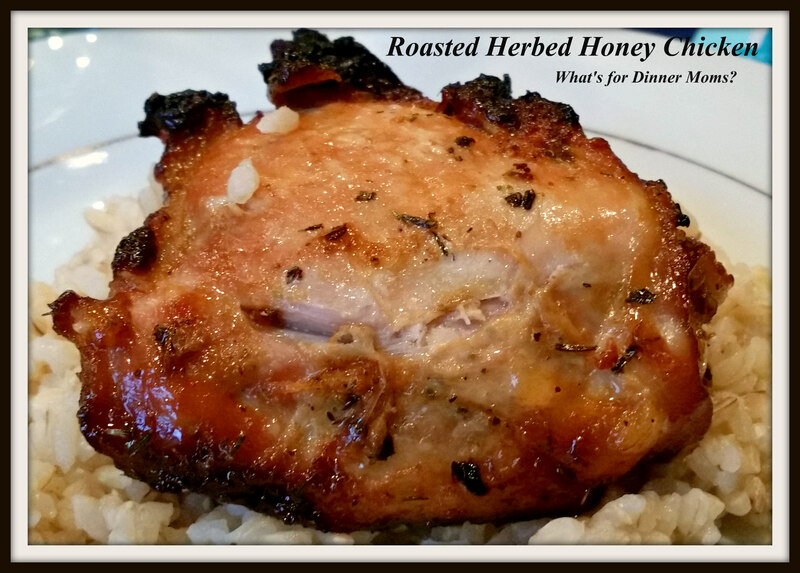 Roasted Herbed Honey Chicken – What's for Dinner Moms? It is Saturday . We made it! (Cheers!) This is a late post because I write in real-time and yesterday was crazy! If you haven’t added your Social Media links to Thursday’s post, please do (click for link to post). I would love to follow you and I am sure others would too! I don’t know about you but this was a long week. Maybe it is because we are 6 weeks from the end of school and everything is being crammed in at once but play rehearsals, Science Olympiad practices, cello lessons, voice lessons, piano lessons, orchestra rehearsals, private dance lessons, regular dance lessons and oh, my daughter has her first Feis (Irish dance competition) of the year this weekend. We haven’t had to do our To-Go dinners that much this year but we are getting back to them. This is a meal that could easily be made into a To-Go meal but make sure you have lots of napkins or Wet-Wipes to clean those sticky fingers! I am usually not a fan of chicken thighs and drumsticks. The picking around the bone and stuff just bothers me sometimes. I think because they chicken was so good and tasty I wanted every last little bite that I didn’t really notice that this time. The skin was crispy and the meat was moist and flavor full. I served this over brown rice with mixed vegetables as a side dish. Melt 2 tablespoons of butter in a large oven proof skillet. Season chicken with salt and pepper. Place chicken in skillet, skin side down and allow to brown about 3-4 minutes. Turn chicken over to brown the other side. To skillet add garlic and remaining butter. Cook 1-2 minutes until it is very fragrant. Remove pan from heat. Stir in brown sugar, honey, oregano, thyme, basil and parsley to garlic. Return chicken to pan and coat with sauce. Place pan in oven for 20-25 minutes until chicken has cooked through. It will need to reach a temperature of at least 165 degrees. Serve chicken over rice if desired. Tip: If you wish to make extra sauce in a separate sauce pan complete steps 4 and 5 with double or triple the ingredients. Then heat over medium-heat until brown sugar has fully melted and sauce thickens. Stir constantly as sauce burns very easily. Taste and adjust spices as necessary to your tastes. I’m not normally a bone- in fan. I got undercooked chicken once and just something about the stains on the bone turn me off now. The flavor profile sounds wonderful though and I’d love to try it with some boneless breasts! Wow this chicken sounds just fantastic! I can’t imagine having all that going on at the same time and yet you still manage to cook a great dinner. Yay! Thanks. It has been tough but we are getting there. Thank you! Busy but my babies are only here for a few more years. I can sleep later! I admire your conviction to cooking even in an all consuming time! This chicken looks amazing, Marci! Thank you, Lana. Conviction or crazy. Hmmm can be the same thing at times!